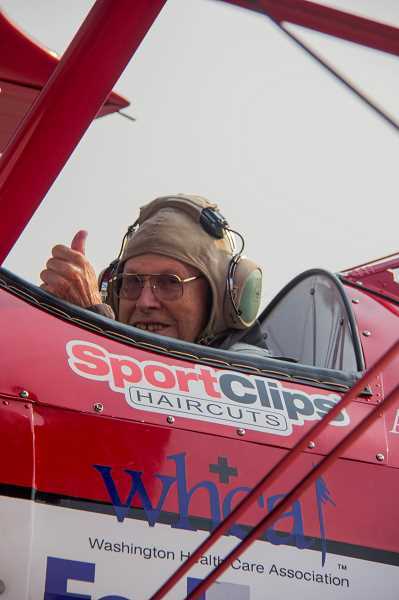 A veterans appreciation event touched down Aug. 15 and 16 at Aurora State Airport, with Portland-area World War II veterans receiving recognition and, for some, a ride in a historic plane. The event, put on by Vital Life Foundation in partnership with Ageless Aviation and Providence Foundation, featured flights for select veterans in a Boeing Stearman biplane, which was used to train military aviators during the war, and group rides in a 1940s DC3 plane. The restored DC3 will actually be flying to Normandy, France next year to honor the 75th anniversary of D-Day. The event also included kids' activities, music, games, trivia and a ceremony that included a speech from Rishi Sharma, a 20-year-old California man who has dedicated his life to interviewing every living World War II combat veteran. Attendees were a mix of veterans and their families, community members, as well as employees, partners and friends of The Vital Life Foundation. The purpose of the event was not only to honor the veterans, but to also preserve the memory of what their generation faced and accomplished. "Spirit of '45 provides an opportunity for America to say 'Thank you!' to those who served in uniform and those who supported them on the home front, the men and women who were the 'ordinary heroes' of WWII," a press release from Vital Life Foundation stated.